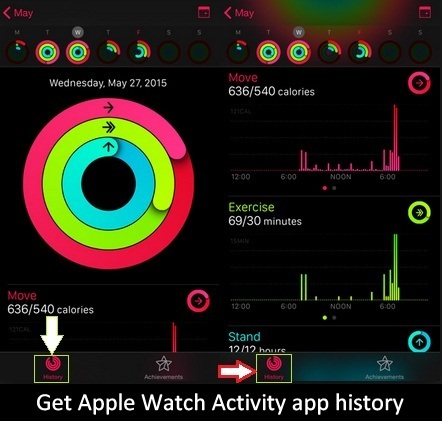 Are you looking for to see Apple Watch Activity app history right? Don’t go anywhere here you know Steps to get Apple iWatch activity app history. Apple Watch Activity app is good app to measures entire day activity Such as burned calories, brisk Activity, how many hours you stand at least 1 minute day to day. Activity app is working with three types of Ring likely Move, Exercise and Stand. All the Rings represent different- different functions. I think, you know only single way to open Activity app but, we’re reveal three ways to open up Activity app. if Activity app glance turn on, then you can open Activity app on your Apple iWatch through Swipe up from the Watch face. You can turn on Activity app glance in the Apple Watch app on your iPhone under Glances > Activity. If you customized iWatch face to show Activity Rings, you can tap them from there to open Activity app. You can also get here Best Running apps for Apple Watch and iPhone 6, 6 Plus. Step 3. Activity app, then Select History located left-bottom side of your iPhone screen. How much useful Apple Watch Activity app history is? You can easily show comparison between day wise, months wise. In addition, you also get your burdened day of the month and year. Daily Variance of calories burned. Active calories, total calories, and completed workouts in the Workout app on your Apple iWatch. We’re happy to share this tip on how to get or Show Apple watch Activity app history on iPhone. Hope, it would be helpful for you. Stay keep in touch with us to get daily newly updates.